Piercing a building envelope with cellular signals will require a part of the system loss budget. To cover 95 percent of indoor spaces will use 17 dB or 98 percent of transmitter power, leaving 2 percent for distance-related propagation losses. We did tests of achievable indoor data rates with 700 MHz Verizon LTE in areas claimed by carrier maps to be fully covered. Propagation of radio signals in obstructed environments is well studied. A tutorial from which the reference list was drawn is available. It is clear that penetration is frequency dependent, and the 700 MHz band released from the analog TV transition is more effective at piercing building envelopes than the cellular bands at 1.9 and 2.5 GHz. That good news does not, however, mean that this is a solved problem. Efforts to get carrier wireless services to penetrate into structures by blasting signals in from outside can provide an improvement in services but generally don't fix a coverage problem. They can cover a portion of a structure. Carriers have funded some enterprise in-building cellular augmentations in high value venues but absent these heroic or expensive efforts, indoor coverage in commercial scale structures is incomplete. In smaller residential structures, indoor penetration works where outdoor signals are especially strong, but not everywhere. To get sample performance information to share with CPUC Staff, we used buildings of opportunity and surveyed for Verizon LTE data service. The selected buildings are not in the service area for any CASF proposal. They are in areas colored and marked to have the same Verizon data service claims as areas within the Sunesys project footprint. These areas list download bandwidth between 10 and 25 Mb/s. Easy negotiated access, availability of building floor plans and construction details to aide in interpreting results all factor into target building selection. 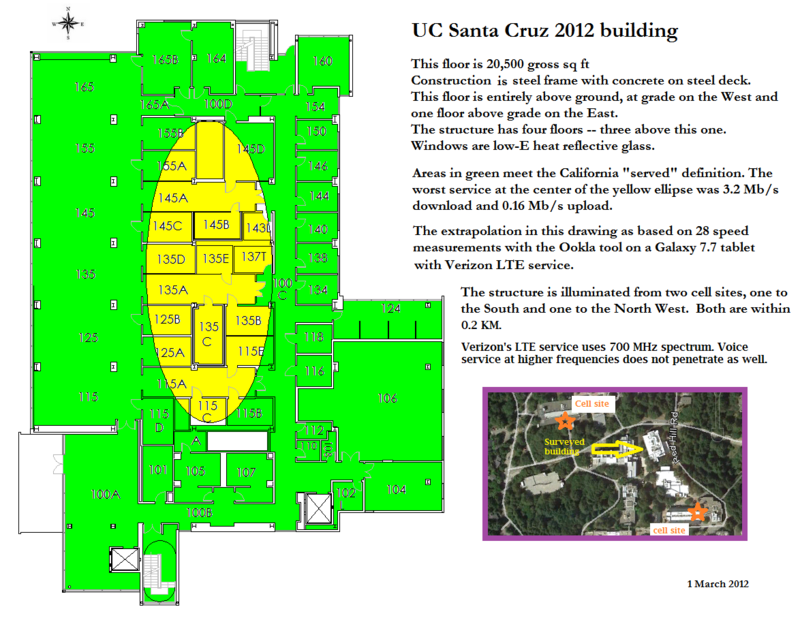 An advantage of University buildings in particular is that campus has a very high cell site density with over 45 carrier-antenna sites on campus. If served broadband coverage can be provided where people live and work from antennas outside structures, it will work here. We use the Ookla program on an Android/Verizon 4G tablet to measure data transfer speeds in both the upload and download directions. Ookla is similar to the CPUC's mobile test application; it uses multiple parallel TCP streams to fill the pipe. In distinction, Ookla finds the closest test node to focus on the access (i.e. wireless) network. The program indicated that it used test hubs in San Francisco and Palo Alto. We found that upload tests fell outside the served level of 1.5 Mbit/sec before the download speed dropped below 6 Mbit/sec. This means performance is limited by handset transmit power rather than base station signal strength. This is not a large building. It is interesting because as a recently constructed structure, it complies fully with Title 24 from which it inherits glass that blocks cellular signals. Direct illumination from two serving sites permits significant but not complete penetration. The elliptical boundary between served and underserved is an approximation. Readers should only accept summary information where access to the observed data is available. At no point in the walking survey did the test tablet lose contact with the cellular network. All tests completed with non-zero results. The library is one of the original campus buildings. It is a four story poured-in-place concrete structure. Built in 1966, it has been expanded twice. The most recent expansion in 2008 is the lower (Southern) portion. It is fitted with low-E metallic coated glass. The original building has had a non-metallic film applied to the uncoated glass to improve its thermal properties. This coating does not substantially block radio signals. Dense rows of metal book shelves are a staple in libraries. There is some shelving on the entrance floor but most of the space is open study area. The seating area for the cafe is directly South of the entrance patio. The Northeast corner is an open staff work area. The serving cell tower is 40 meters above the library through a heavily forested area. 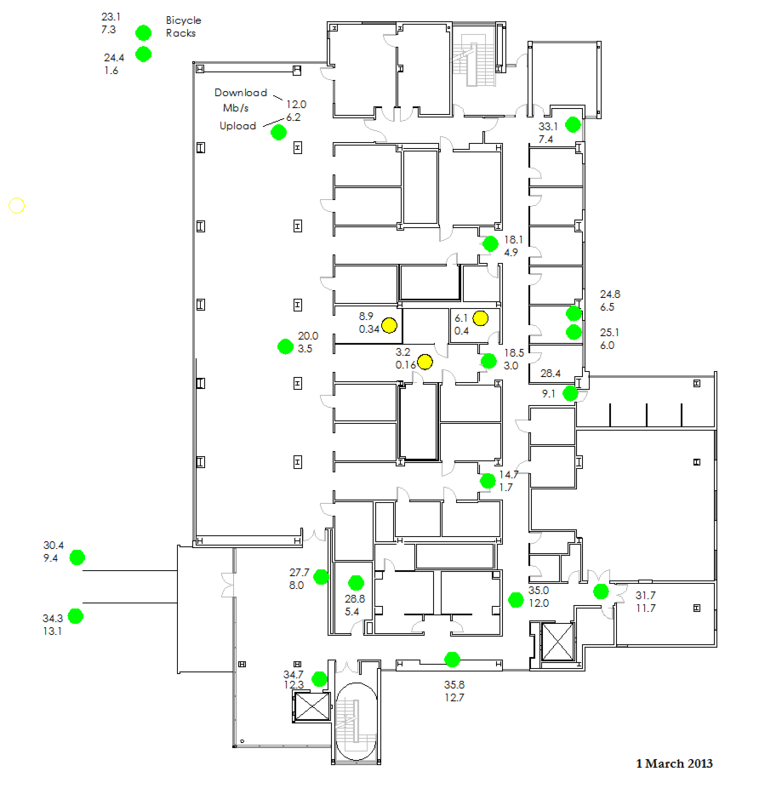 The general methodology for a walking survey is to start in an area with a strong signal and work into the building. Data was recorded on a copy of the floor plan after each measurement. It is apparent there is significant hysteresis in the attachment to the cellular network. A signal sufficient to maintain a connection to the network may not be strong enough to permit a device to join the network. If a test fails because the handset dropped off the net, it will not reattach until it is moved to an area with a stronger signal. The test program hangs, burning battery but not much else. In this building, the service was either LTE or there was no service. The handset did not degrade to Verizon's 3G or 1X networks. In the green areas that supported 6 Mb/s down and 1.5 Mb/s up, we did not get dropped. In under-served areas we were at substantial risk of losing the connection to the network entirely. That no useful work could be done in the yellow areas is a reflection of the absence of Verizon's 3G service. All of West Santa Cruz is colored on Verizon's coverage map [below] as full service LTE. Verizon has a map category they refer to as an extended service that offers a lower level of service. None of West Santa Cruz is in an extended service area. Data Verizon submitted to the CPUC has been published on the California Interactive Broadband Map. It indicates that West Santa Cruz will fall into the 10 to 25 Mb/s download band and therefore should handily meet California standards as served. Supermarkets are easy to survey because they offer public access and have an open floor plan. The Santa Cruz Safeway was constructed to current codes. It opened in November 2009. We hoped that a LEED building in full service area would make a good test for signal loss penetrating into a commercial structure. Our results are detailed below. The same testing method described above was used for the Safeway building. 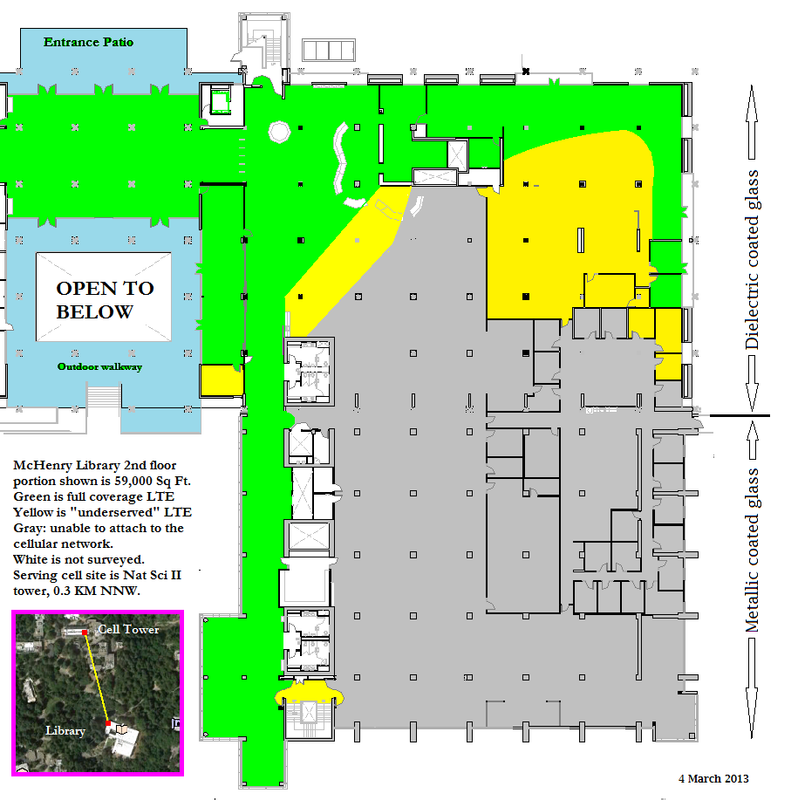 A posted exit map was photographed and traced to provide a background to present the results. We are not inclined to provide a colored map to represent the California defined service levels in the store. It would all be the same color. All fourteen indoor tests failed to meet California served criteria. The good news is that with patience, we could get all the tests to complete. Here 3G is an effective fallback when 4G-LTE is not available, but speeds are about an order of magnitude less than the California download served definition. Data rate tests were also performed outside the structure. Initially, we got erratic numbers outside the building with 8 p.m. measurements. We went back and made measurements at a presumed period of low use -- 7 a.m. Saturday. The morning measurements were more consistent and are on the drawing. They are also considerably higher. Several points inside the market were rechecked. The indoor measurements did not show the same time-of-day sensitivity perhaps because many of them used Verizon's 3G network which may be less congested. Clearly, there is an opportunity here for an extended study. It is of some interest that outdoor measurements show data rates lower than the Verizonwireless claims on the California Interactive Broadband map. It could be that Verizon's propagation models account for topography but not for structures or foliage. We are inclined to trust our measurements because of the excellent reports from outdoor data transfers on the UC campus and because the CPE test tablet was procured from Verizon. Some buildings are close enough to a cellular transmitter that signal losses from the building skin can be overcome. Here is an example of such a structure.The horizontal distance from the center of the building to the cell mast is 60 meters. This is a single story 200 seat auditorium. All tests exceeded 30 Mb/s download and 11 Mb/s upload speed. This structure is uncommonly close to its cell site. It is unusual for the path loss to be so low that the building skin can be penetrated with no apparent effect.